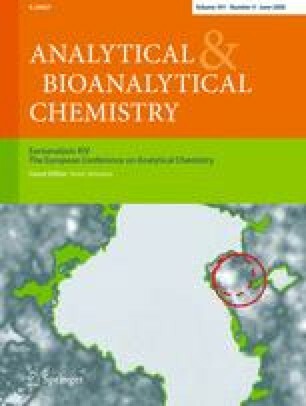 A validated method based on solid-phase extraction (SPE) and liquid chromatography–ion trap tandem mass spectrometry (LC-MS/MS) is described for the determination of cocaine (COC) and its principal metabolites, benzoylecgonine (BE) and ecgonine methyl ester (EME), in waste and surface water. Several SPE adsorbents were investigated and the highest recoveries (95.7 ± 5.5, 91.8 ± 2.2 and 72.5 ± 5.3% for COC, BE and EME, respectively) were obtained for OASIS HLB® cartridges (6 mL/500 mg) using 100 mL of waste water or 500 mL of surface water. Extracts were analysed by reversed-phase (RP) or hydrophilic interaction (HILIC) LC-MS/MS in positive ion mode with multiple reactions monitoring (MRM); the latter is the first reported application of the HILIC technique for drugs of abuse in water samples. Corresponding deuterated internal standards were used for quantification. The method limits of quantification (LOQs) for COC and BE were 4 and 2 ng L−1, respectively, when RPLC was used and 1, 0.5 and 20 ng L−1 for COC, BE and EME, respectively, with the HILIC setup. For COC and BE, the LOQs were below the concentrations measured in real water samples. Stability tests were conducted to establish the optimal conditions for sample storage (pH, temperature and time). The degradation of COC was minimal at −20 °C and pH = 2, but it was substantial at +20 °C and pH = 6. The validated method was applied to a set of waste and surface water samples collected in Belgium. While human and veterinary pharmaceutical compounds have been monitored in the environment for more than 10 years, the detection of drugs of abuse in waste and surface water samples has only recently surfaced. The measurement of cocaine and metabolites in environmental water samples is an innovative approach for the estimation of cocaine consumption by the general population. Dr. Adrian Covaci acknowledges the financial support granted by a postdoctoral fellowship by Flanders Scientific Funds for Research (FWO). Dr. Adriana Gheorghe acknowledges the fellowship offered by the Francqui fonds, while Alexander van Nuijs thanks the University of Antwerp for his scholarship. The sampling of WWTPs was done in cooperation with Aquafin Flanders. The present study was presented as a poster at the Euroanalysis XIV Symposium, 9–14 September 2007, Antwerp, Belgium, and was partially supported through a project financed by the Belgian Science Policy (Federal Drug Policy), contract DR/00/047.